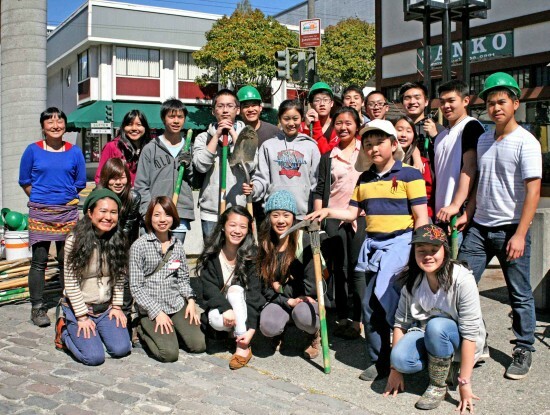 SAN FRANCISCO — Thanks to the combined effort of a number of organizations and volunteers, new cherry trees now grace portions of Laguna and Sutter streets and the Buchanan Mall in San Francisco Japantown. It took the Department of Public Works (DPW) to remove some stumps, the Friends of the Urban Forest (FUF) to provide instructions on the planting of the trees, a cadre of volunteers, many from Japanese Community Youth Council’s Japantown Youth Leaders (JYL), to dig the holes, plant and stake the trees, then clean up, and the Nihonmachi Parking Corporation (NPC) to provide bottled water, pay for the cherry trees, and give gift certificates for the JYL volunteers. The FUF staff was instrumental seeing that the trees were properly prepared and planted, as well as placing the stakes and strapping to prevent the trees from being affected by the wind. The trees along Laguna and Sutter were donated by the Sakura 150 Cherry Tree Project to commemorate the first Japanese government delegation to Washington, which arrived in San Francisco aboard the Kanrin Maru in 1860.